The second film in Francis Ford Coppola’s epic trilogy builds on the winning formula established in the first film, but raises the stakes even higher, this time challenging viewers and daring them to sympathize with one of film’s most complicated anti-heroes. The Godfather Part II features two main story arcs, the first focusing on Michael Corleone (Al Pacino) after his rise to Don of the Corleone crime family, and the second taking place in the early 1900’s, seeing the rise of Vito Corleone (Robert De Niro) upon his arrival to America. Michael is attempting to expand the reach of his newly attained syndicate, but is held back by internal betrayals, assassination attempts, and government interference. In order to be seen as a truly powerful and successful Don, Michael must decide what is most important: the syndicate, or his own family. The Godfather Part II is easily the most complex and nuanced chapter in Coppola’s trilogy, introducing a wide arrange of new characters, all of whom have their own complicated allegiances and motivations. The screenplay is masterful, advancing the character of Michael Corleone into territory rarely explored in films up to this point – transforming him from an ambitious, conflicted young man in the first film, into a full-blooded ruthless Don in Part II. Al Pacino’s portrayal of Michael Corleone is perhaps one of the best performances of his entire career, perfectly capturing the stark transformation of his character – every minor change in personality and attitude makes sense and comes off as entirely believable. The performance of Robert De Niro as the young Vito Corleone is also very noteworthy, serving as a perfect launching pad for De Niro’s career to follow. Vito’s character arc in the film’s flashback scenes is very similar to Michael’s between the first two films, which adds to the story’s underlying beauty and inherent tragedy. Francis Ford Coppola’s incredible direction and writing featured in The Godfather Part II set unmatchable standards for sequels to follow, and many would argue that it is the greatest sequel ever made. It raises the already urgent stakes found in the first film using Michael’s own justified paranoia and his internal struggle with advancing the syndicate. Rather than simply continuing the story and delivering more of the same, The Godfather Part II feels like the next logical step in terms of character development, plot, and themes – it’s bigger, meaner, and more challenging than the original. Part II brought home six Academy Awards, including Best Director (Francis Ford Coppola), Best Picture, Best Supporting Actor (Robert De Niro), and Best Writing (Coppola and Mario Puzo) – adding to the impressive three Oscars earned by the first film. The Godfather Part II is intelligent, intense, heartbreaking, incredibly well-paced thanks to its script, features Al Pacino in a career-best performance, and a young and hungry Robert De Niro who dominates every scenes he’s featured in. If you’ve never seen The Godfather trilogy, you owe it to yourself to give it a shot. Martin Scorsese’s classic tale of a deluded wannabe comedian made an immediate impression with me, exceeding any expectation I held. The King of Comedy tells the disturbing story of Rupert Pupkin (Robert De Niro), a man obsessed with successful comedian and television host Jerry Langford (Jerry Lewis). He fantasizes day and night about Langford launching him to stardom, even though Pupkin has no real comedic leg to stand on. After facing constant rejection, Rupert decides to kidnap Langford in exchange for ten minutes on his program. While Scorsese’s film has very funny moments throughout, The King of Comedy is a surprisingly dark affair. It’s a deeply cynical satirical look at celebrity worship, taking it to numerous extremes. The script by film critic Paul D. Zimmerman is tremendous, combining a sharp wit with a dark, cynical worldview, and terrific moments of character development. His Rupert Pupkin is easily one of the most compelling characters ever played by Robert De Niro, who brings a deranged, clueless twist to the role. His performance holds up the entire film, making the audience fear him and sympathize with him simultaneously. Jerry Lewis’ performance as Jerry Langford is quite good too, and the fact that his character is hardly phased by anything really adds to the film’s comedic flavor. My favorite moments in the film are the many times Rupert Pupkin’s name is mispronounced, and the nonchalant way De Niro’s character plays it off. While The King of Comedy may never reach the dramatic highs of Scorsese’s Raging Bull or Taxi Driver, it serves as a compelling and at times disturbing character study, and its themes of celebrity worship and the desire to become famous really resonate. Director Matthew Vaughn started his career with 2004’s indie-crime film, Layer Cake, which was released to both widespread critical and audience acclaim, and has gone on to become a cult film in the same vain as Guy Ritchie’s Lock Stock and Two Smoking Barrels. Since Layer Cake, Matthew Vaughn has gone on to become one of Hollywood’s most interesting directors, and easily one of the go-to filmmakers for action and crime films. Stardust was Vaughn’s sophomore directing attempt, and Vaughn again manages to hit it out of the park. Stardust is based on the Neil Gaiman novel of the same name, and is about a young man called Tristan Thorn (Charlie Cox). Tristan’s father crossed over the wall into the magical kingdom of Stormhold eighteen years previous, and met Tristan’s mother, an enslaved princess named Una. The King of Stormhold is on his deathbed, and after deciding to let his sons compete for the throne, throws a ruby into the sky for his sons to retrieve. The ruby collides with a nearby star, sending both crashing back down to the earth. Tristan Thorn travels to the star, and finds a young girl named Yvaine (Claire Danes) who he precedes to take with him. A group of three witches, led by Lamia (Michelle Pfeiffer) learns of the fallen star and decides to find the young woman and eat her heart, thereby recovering the three witches’ youth and magical powers. With the assistance of his mother and a flamboyant pirate of the sky (Robert De Niro), Tristan must win his true love and save Yvain from certain doom. Going into a film like Stardust is always a very intimidating prospect, because most films in the fantasy genre simply don’t turn out very well in the end. In the years following Peter Jackson’s Lord of the Rings trilogy, many franchises and stand-alone fantasy epics were attempted, and mostly failed (with the exception of The Chronicles of Narnia), and Stardust looked to be no different. Fortunately for audiences worldwide, Stardust is loaded with more than enough talent to make it work, and make it work well. Director Matthew Vaughn knows how to pace a film of this proportion, and his direction is remarkable throughout. His action scenes flow together incredibly well, and he commands his exceptionally talented cast to some very impressive performances. 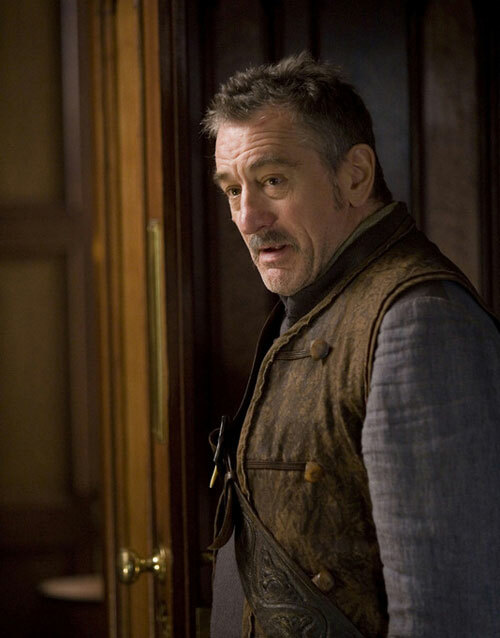 Robert De Niro in particular puts in a very fun performance as Captain Shakespeare, the flamboyant sky pirate, easily giving the film it’s most heartfelt and tear-inducing moment towards the end of the film. The only elements that don’t work for Stardust are its score, composed by long-time Matthew Vaughn collaborator Ilan Eshkeri. It’s not that the score is particularly bad, just that it feels like and sounds very similar at times to Howard Shore’s score for the Lord of the Rings trilogy. It took me out of the film in a few moments, and I felt that a less inspired composition might have worked far better. 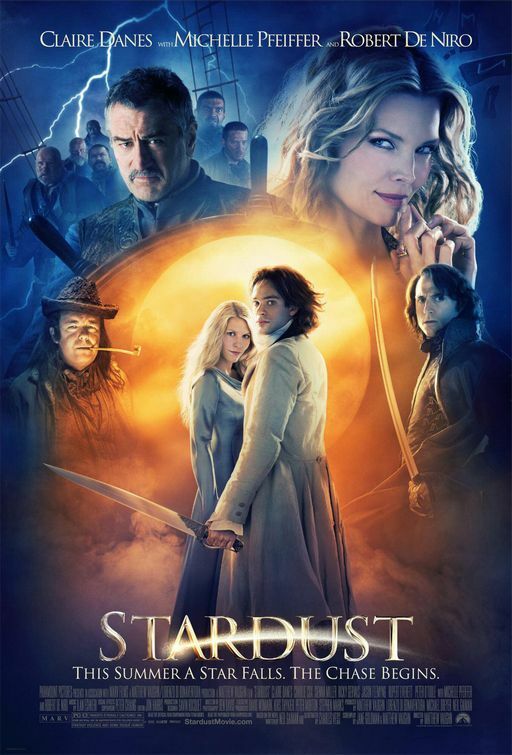 Overall, Stardust is an incredibly fun and entertaining discovery for the fantasy genre, and a film that completely took many people by surprise. A talented director and cast help this film rise from a mediocre and forgettable film to a cult favourite that will continue to entertain for years. I highly recommend Stardust to anybody interested in epic fantasy films. 8/10.